In this “inequity aversion” experiment two dogs were taught to give paw and were then rewarded unequally. One dog, the little black one on the right, was always given a treat for his performance. The bigger Border Collie dog, the subject of the experiment, was initially given a treat for giving paw but then, while the companion dog continued to get his treat, was not given a treat for performing correctly. The subject dog ultimately quits offering his paw. Interestingly when the subject dog was tested by himself he continuously and compulsively offered his paw even though he wasn’t being rewarded. What then is different from the subject dog’s point of view when in the presence of the companion dog? The systems’ logic of the group dynamic. The second vital link to understanding the group logic is to recognize that as an object-of-attraction, a treat cannot absorb the combined energies of the two dogs. 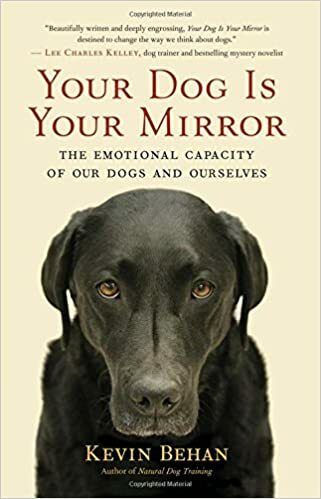 In other words, each dog doesn’t have a “200 volt problem” (the degree to which each individual is displaced by the stimulation of food), they each have a “400 volt problem” since they are emotionally coupled to each other via emotional projection. The food morsel isn’t big enough, hard enough, or resist enough to ground out “400 volts” of combined attraction and therefore they will have to emotionally ionize to fit into the same frame of reference. Energy of attraction has to go somewhere. This is akin to the wolf pack working flawlessly together when the prey is alive and resisting because the prey can absorb their combined energies, and the feat of hunting conducts the full measure of each individuals’ locomotive impulse. Hunting a prey animal conducts and absorbs the combined energies of the group. Then, as soon as the prey is dead on the ground, the pack descends into a tense, hair bristling, teeth baring positioning over the carcass. The only difference between the two contexts is the absorptive and conductive properties of a running prey versus a motionless body. So just as the pack can’t all fit into the same frame of reference when the prey is inert, but can when the prey is running and/or fighting back, the subject dog can fit in the same frame with the human who is asking for the paw and so can sustain the behavior dozens of times, but when another dog is added to the dynamic the absorptive/conductive value of giving paw for food is no longer sufficient for the amount of load in the system. This deficit becomes paramount for the subject dog once the flow of food is cut off. A third vital component in the group dynamic is direction of flow. The human in the experiment establishes a direction of flow, a path of resistance with food traveling from human to dog. So in the absence of the companion dog, within the mind of the subject dog this basic primal conduit (around which the animal mind is configured) is never challenged. When tested alone the subject dog relentlessly paws on even when there is no return on his effort because the path is unambiguous. But when a companion dog is introduced, the path becomes bifurcated and imperceptible. This is why in a multi-dog household, if one calls one dog their other dog is most likely to come to them as well. In fact it’s a special and lengthy training process to have two separate flow streams cohabiting coherently in a dog’s mind. The subject dog doesn’t refuse to give paw out of an understanding of fairness (and wouldn’t anger be the more primitive and hence more likely response to a comprehension of inequity?). Rather he’s trying to fit himself into this new group dynamic. All behavior represents a transfer of force, and all movements begin with a shifting of weight, and as he meets with resistance he begins to run through the tried and true playbook. He shuffles from side to side, he licks his lips and then finally he flips altogether from projecting to collecting, i.e. backing up to absorb the force being directed at him. He’s not refusing to work, he’s simply exhausted all his options and is becoming confused. Eventually he will become fully ionized so that he becomes the polar opposite of his companion and the confusion will dissolve. Note how the locomotive rhythm is being expressed differently in both dogs. The subject dog is feeling repulsed by the extended hand of the tester. Meanwhile the companion dog is extending his paw forward. They have become emotionally ionized. The companion dog is extending his paw for the same reason, and in equal/opposite form, that the subject dog is in withdrawal. Interpreting the subject dog’s behavior as due to a sense of fairness would be like interpreting the companion dog’s behavior of extending its paw when it’s not his turn as due to a sense of entitlement. Since the companion dog is occupying the projection phase of the locomotive wave by being pulled forward, the subject dog is being pushed into the collecting phase. The researchers are correct that we’re seeing here the rudimentary basis of moral behavior. But they’re missing the all important phenomenon of emotional projection. The problem for the human intellect in interpreting these experiments is to not to tell a story, in this case one that is composed of three distinct beings, each one supposedly driven by a narrative, rational outside/in perspective, informed by an intentional state, wherein what is happening out there, a who-did-what-to-who-and-when sequence of events that causes what is felt inside. The group mind in contrast is an inside/out perspective, as in what I feel in here causes what happens out there to happen. When a human gives a dog a treat for giving paw, the dog doesn’t record this narratively as two separate entities in some kind of discourse, as in: “If I give my paw then she gives me a cookie.” An inside/out perspective runs like this, “I lick my lips, shift my weight and through this internal focus on my p-cog that then renders a movement in complementary form to the object I’m attracted to, literally Will the food into my mouth. I move the human by the force of concentration I can subliminally bring to bear on my p-cog just as I am able to move my own body.” The dog extends its paw as a function of an internal focus on its p-cog and sure enough the human hand extends and pops food into its mouth. The dog feels that the human is an extension of his own body because he can map his locomotive rhythm onto her form and movements. 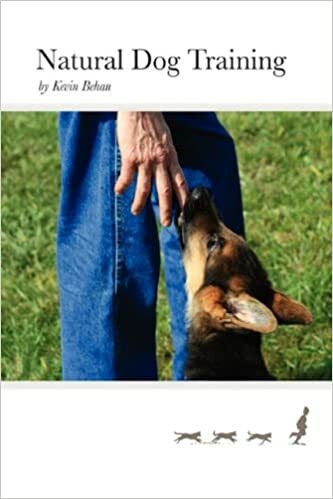 But when the subject dog sees the companion dog being given food the amount of emotional momentum he feels for the movement of Range’s hand is perceived of as an actual force and when he can’t ground it out with the food, then it pushes against him rather than him experiencing the hand with food being pulled toward him. He can’t map his locomotive rhythm onto the dog and human’s movements in that particular context. So the energy of Pull becomes an energy of Push and so he begins to shift from the physical memories encoded according to a Pull, to the physical memories encoded according to a Push. Thus the subject dog shifts from projecting force outward—giving paw—-to absorbing force inward—lip licking, foot shuffling and backing up. Everything a dog knows of the world, and how to interact with others comes through movement. Movement is a transfer of force and all movement begins with an internal apprehension of the body’s physical center-of-gravity, the seed of the inside/out perspective around which the animal mind crystalizes. When the locomotive rhythm is mapped onto complex objects-of-resistance (things that have a mind of their own) then a group dynamic impresses a unitary wave form onto each component so that if one is UP, the other becomes DOWN and they align around a basic direction of flow. Then they must synchronize and we next observe a further elaboration of emotional polarization with one becoming Active, the other Reactive. One is Direct, the other becomes Indirect. In this experiment we observed the subject dog shift from UP to DOWN, and then from Active and Direct, to Reactive and Indirect. He’s becoming the equal and opposite to the companion dog. They’re becoming a group. So I do agree with the spirit of the experiment that they are uncovering the essential component of the moral apprehension in humans, it’s just that they’re barking up the wrong cognitive tree. It’s the c-o-g in cognition that’s being projected emotionally and informing the good social graces of the subject dog. The subject dog isn’t thinking what to do, he is feeling it. It isn’t cognitive. It’s emotional.